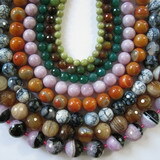 Semi-precious stones are our fastest selling beads, so any photo would be immediately dated. We always have moderately priced jaspers, agates, onyx and the like, plus the 'nicer' stones like spinnel, sapphires and tourmaline, cut-up and on strands, always looking for the unusual cuts. 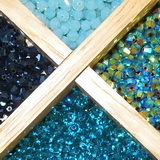 We carry hundreds of colors of Japanese seedbeads in rounds (6/o-15/o), delicas, magatamas, cubes, triangles and more. 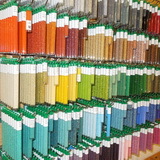 Plus, for our beadweaving customers, we carry John James and Tulip beading needles, Fireline, Miyuki beading thread, buttons, rivolis, cabachons, sticky stuff, etc. Mainly bicones and rounds, both Swarovski and Chinese. 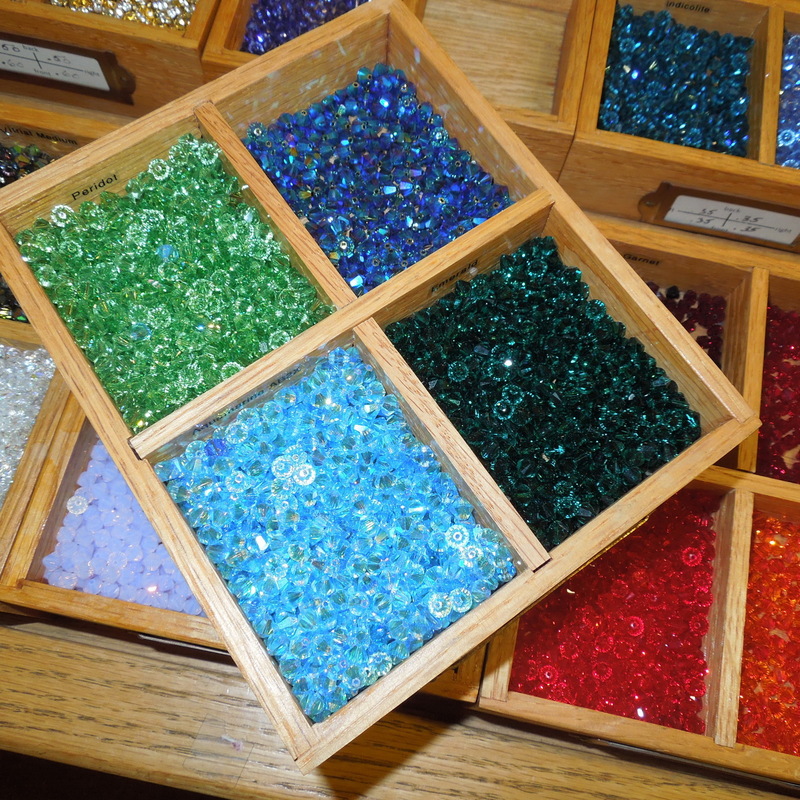 Swarovski crystals in 3mm, 4mm, 6mm and 8mm, including AB2X colors and special finishes (satin, cathedral, etc.). 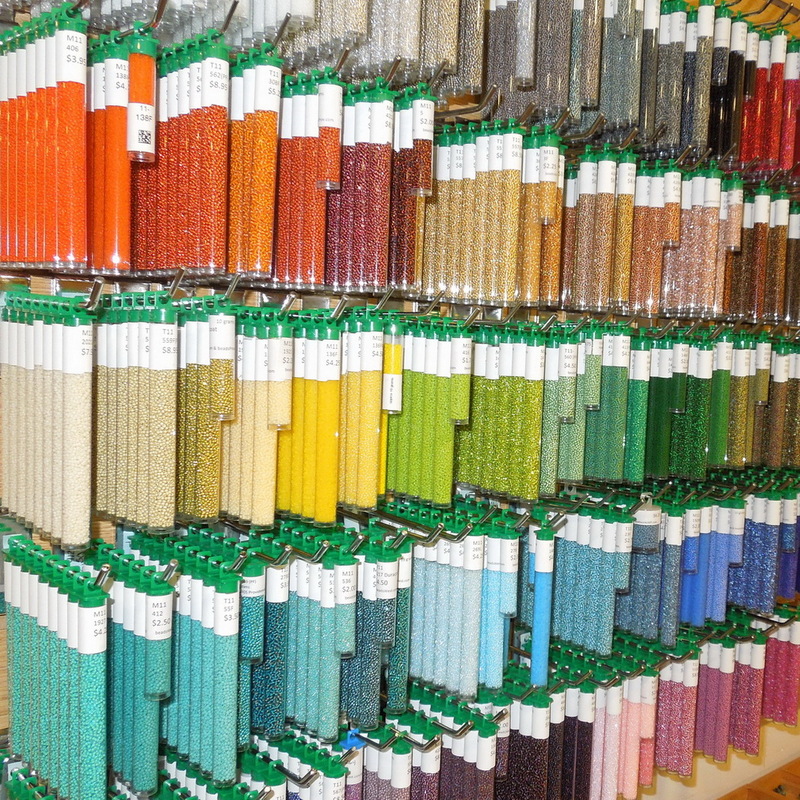 Quantity discounts – especially helpful for beadweaving projects. Genuine Swarovski bling balls. This is the fun category! Most popular are skulls and Buddhas, and we've got them in bone, wood, Raku ceramic and natural stones. 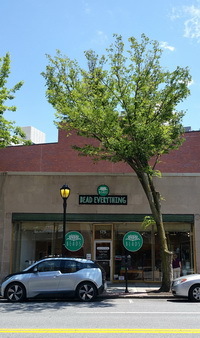 Ohms, tree of life, evil eye, religious and more. Charms from Nina, Green Girl and more. Most of our glass is from the Czech Republic - we think their quality is the best, but we also fill in with Chinese and Indian glass. 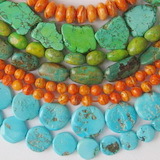 Fire polish (primarily 3 & 4mm) in over 100 colors, an assortment of ceramic beads, and Pandora style big hole beads. 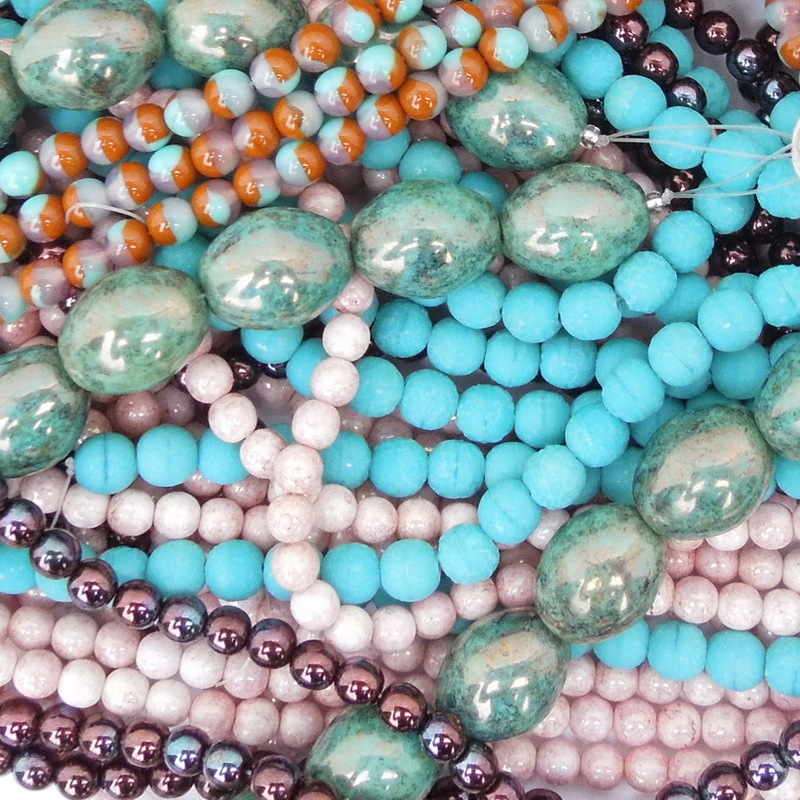 These are our most popular classes, so we carry all the materials you need to create your own pieces in these styles. 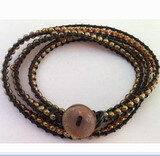 For Chan Luu style bracelets, we have 4mm rounds in lots of materials and buttons to match. Beads, bling balls and Chinese knotting cord for Shamballa. 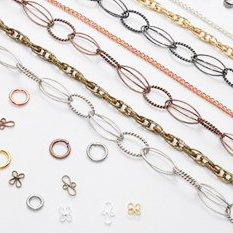 Kumihimo disks/bobbins/findings, and C-lon. Sterling, gold filled, plated and non-tarnishing craft wire. Chain in sterling and gold filled, plus plated chain in silver, gold, Hamilton gold, antique brass, gun metal and antique copper finishes. 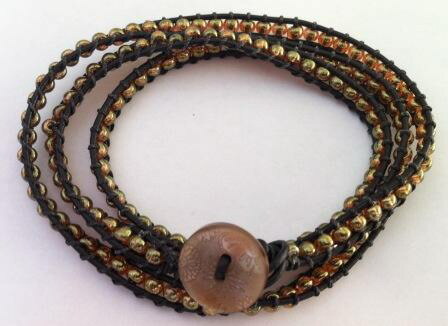 Beads and clasps in precious and plated metals. 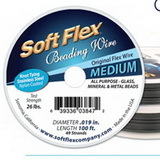 Just about every type of stringing material you could want, from Softflex, and Fireline, to Greek leather, waxed cotton, Chinese knotting cord, carded silk and hand dyed silk strands, satin, faux suede, C-lon, and elastic. 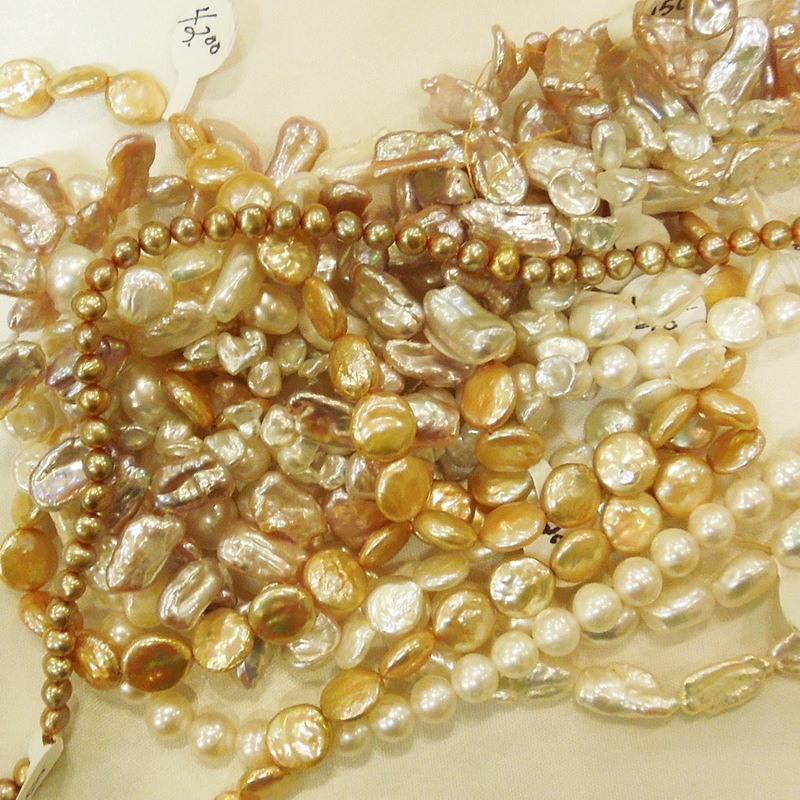 Most of our pearls are fresh water, and we always have coin, round, potato, top drilled drops and keishi, on strands and cut up. 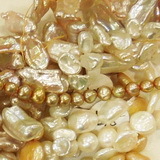 Plus Swarovski pearl rounds in lots of sizes, shell pearls and inexpensive glass pearls. 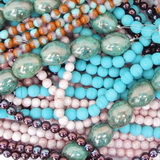 We always have real turquoise, coral in reds and pinks, and mother of pearl. Plus there's always lots of wood, bone and horn.